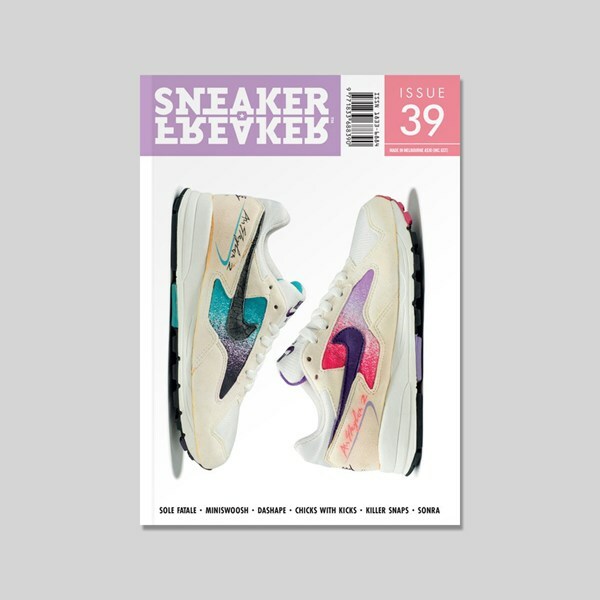 With over 200 pages of content, Issue 39 is chock-a-block with sneakers, kicks, trainers and creps! The major features are an impressively mix that cover everything from Dashape's collection of 90s Nikes to Reina Koyano's sneaker-inspired pinups. We also conduct a masterclass of sneaker photography with Seth Hematch and catch up with the Chicks with Kicks, whose insane collection of over 6000 pairs of rare, crazy and one-of-none promo releases has to be seen to be believed. We also pay tribute to the Sneaker Freaker forum which was recently shut down after 15 years or service and over 500,000 posts. Interviews with Sonra, Miniswoosh and Kickslove are the icing on top! Breaking with tradition, Sneaker Freaker #39 is printed on a luxurious satin 'Hanno' stock with super rich colour and enhanced clarity. It's also a noticeably heavier than previous magazines – our gift to you! Multiple covers are printed of each magazine but content is the same of each issue.